I love caramel. No, really. Love it. It’s one of the few things in my life I’d commit to because I know my love is everlasting. I have found reason to cut back (way back to nothing) on dairy recently. It saddens me. Mostly because of cheese (my other love). But also because of caramel. The truth, though, is it’s good that I have to avoid caramel made with dairy. Why, you ask? Because how often do you get plain old, delicious, perfect caramel? Maybe at Christmas time. Usually, though, I’m stuck eating caramel with something. Like with chocolate coating. Or with some type of nuts. The real craving is for caramel. Just caramel. And not those blocks of Kraft caramels. You know, the plastic-wrapped ones that are good, but also kind of hard and not quite creamy enough. Those are good candies for grandpas to carry in the front pocked of their overalls, but they’re not good for adults who know what real love is. A week or so ago, Tropical Traditions had coconut cream concentrate on sale. Coconut cream concentrate, also called coconut butter, is essentially ground up coconut. Similar to how peanut butter or almond butter is just ground up peanuts or almonds. Can you make this stuff yourself? Sure. But it was on sale, and Tropical Traditions is a very reputable company. I bought a gallon of their Gold Label virgin coconut oil this last winter from them, and it’s already almost gone. I’m a single girl. I’m not ashamed of my intake of medium chain fatty acids! Anyway, this isn’t an advertisement for Tropical Traditions. Although, if you’re wondering, yes, you should buy from them. 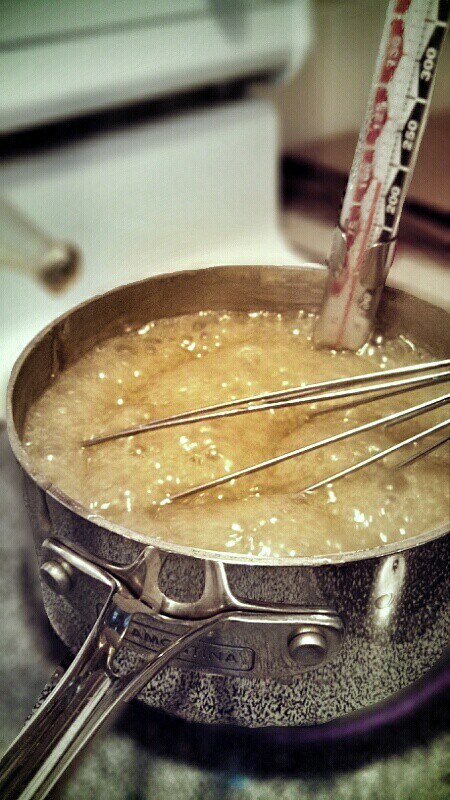 This is for what the coconut cream concentrate inspired me to do: make my very first caramels! Sweet mother of deliciousness. Is this what it’s like to have faith that there’s good in the world?